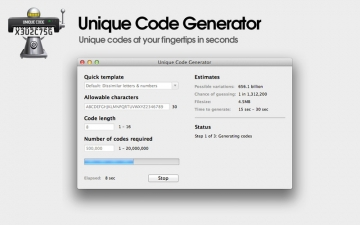 Unique Code Generator | Mac App Storeのアプリ検索・ランキング BuzzMac! 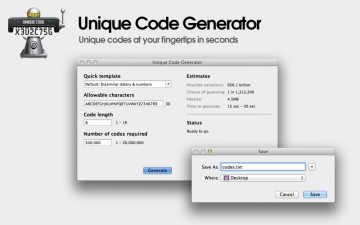 Unique Code Generator is the most powerful, fastest and most accurate way to generate millions of unique codes on your Mac. Unique codes are perfect to use as voucher codes, in on-pack promotions, loyalty schemes, product serial numbers, tickets, lotteries, PIN codes and passwords. Choose from the Quick templates or pick your own allowable characters. Anything up to a 16 character maximum code length. Generate up to 20 million codes in a matter of seconds. The exact number of codes you need, 100% unique, every time. You can choose .TXT (default) or .CSV files so they can be easily imported into other applications. Codes are created one per line. Instantly find out the number of variations and likelihood of guessing. Free updates. No repeating charges. All for the price of a cup of coffee. 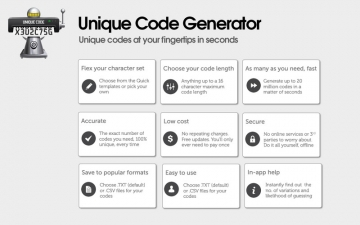 Unique Code Generator could be used by marketers, printers, competition promoters, developers and you?